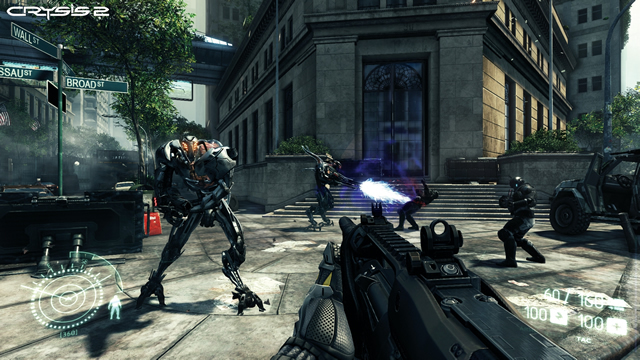 It was just confirmed that Crysis 2 will not be released until March 22, 2011, but that shouldn’t stop you from being justifiably excited by the first glimpse at the multiplayer side of the game, that Crytek just released at Gamescon. Below is a video of the multiplayer gameplay, thanks to Filefront. Beyond the look and a few neat tricks like the invisibility, we still don’t know much about this side of the game. It will offer 6 game modes, 80 ranks to work your way up through, 12 NYC locations, and 60 nanosuit upgrades. Other than that it is all guesswork. Check out the trailer below and then prepare for a long, impatient wait until we actually have this game in our hands.